It’s nearly time for that long hot summer and what are you going to do with the children? There’s the beach of course, but it is also a great opportunity for children to learn how to play tennis, or improve their playing skills considerably. Don’t forget it’s also fun and good for fitness. 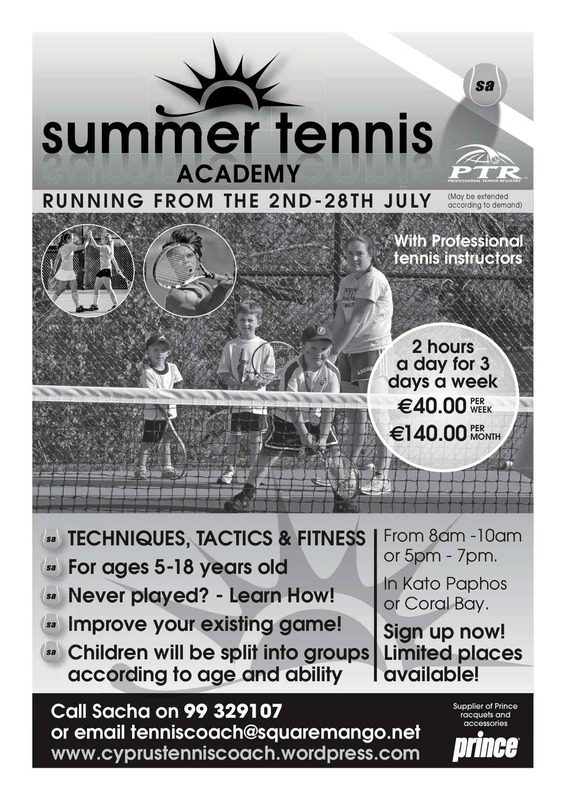 So, throughout July (and possibly August) I will be running a Summer Tennis Academy down in Kato Pafos and Coral Bay. It will be for 2 hours a day for 3 days a week. All aspects of the game will be covered, with the course tailored for each group. On registering, please say which times suit you best (8-10am or 5-7pm), which days, which location and also provide the age of the child or children and their playing ability. From this I will then be able to put together groups of roughly the same age and ability. To be able to do this, please be as flexible as possible in terms of times and days. Any age from 5-18 years can take part and lessons can be in English, French or Greek. Cost will be €40 per week, or €140 for the month. This entry was posted in Cyprus Tennis Coaching, Events, News and tagged Aphrodite Hills, Baghdatis, Children Tennis Coaching, Cyprus, Cyprus Tennis, Cyprus Tennis Coach, Cyprus Tennis Federation, Learning Tennis, Play Tennis in Cyprus, Tennis, Tennis Academies in Cyprus, Tennis Academy, Tennis Centre, Tennis Club, Tennis Clubs in Cyprus, Tennis Clubs in Limassol, Tennis Clubs in Paphos, Tennis Coaching, Tennis Coaching Pafos, Tennis Courses, Tennis Equipment, Tennis Holiday, Tennis in Cyprus, Tennis in Limassol, Tennis in Pafos, Tennis in Paphos, Tennis Lessons Cyprus, Tennis Lessons in Cyprus, Tennis Lesssons Pafos, Tennis School, Tennis Tournaments in Cyprus, Womens Tennis by Paphos Tennis Coach. Bookmark the permalink.